Maureen and I get on a plane to fly to New Mexico. It will be my first trip to the state since I was a little boy (my father would drive his family all over the country in his Belair station wagon for vacations, despite the fact that there were six of us kids, and we tended to be cranky in our confined space…). We pick up a rental car at the Albuquerque airport and drive up to Santa Fe. As we enter the southern suburbs on I-25, it becomes immediately apparent that the City works hard to ensure that new buildings are architecturally consistent. Even in the suburbs, nearly all homes, shops, offices and gas stations are beige adobe architecture. Charming, visually. A city that strives to say "WE ARE NOT ANYWHERE USA!" As an avid "contra" dancer, the first item on my agenda is to attend the monthly contra dance (live fiddle band, caller) which happens to be held our first night in Santa Fe. Unfortunately, the dance hall is rather inaccessible, except by car. For me, I find that I need to walk several blocks along a hostile, high-speed highway on a dirt path (no sidewalk) to get to the place. There does not seem to be any residences or retail in the immediate vicinity. I notice that there is essentially no difference in styles or calls from what I am used to on the other side of America on the East Coast. Smaller dance floor than I am used to, but the wood floor is good quality, as is the caller and band. A smaller number of dancers than I experience in Florida, but the skills are nearly as good as what I know back home. Overall, an enjoyable way to start the trip. On this first day, I get a taste of something I don’t experience in Florida: Duststorms. Twice on this first day, I see mysterious, large brown clouds in the immediate horizon pass in front of me. It is dust and sand being carried by strong winds across the roadway. Fortunately, they dissipate quickly. The City of Santa Fe (population approximately 60,000) is, at 7,000 feet of elevation, fairly compact, and therefore relatively walkable. Most all of the in-town area, which is a bit too "touristy" in nature for my taste, can be walked in a few hours. It is the oldest capital city in the country, founded in 1607. Day two starts off sunny. The air is crisply fresh, breezy and clean (particularly following a rain event), so noticeable for us Floridians, who are used to damp, heavy air. We greedily breath deeply to fill our lungs with the air, and enjoy the clouds and horizon, so vivid because the air is so dry. 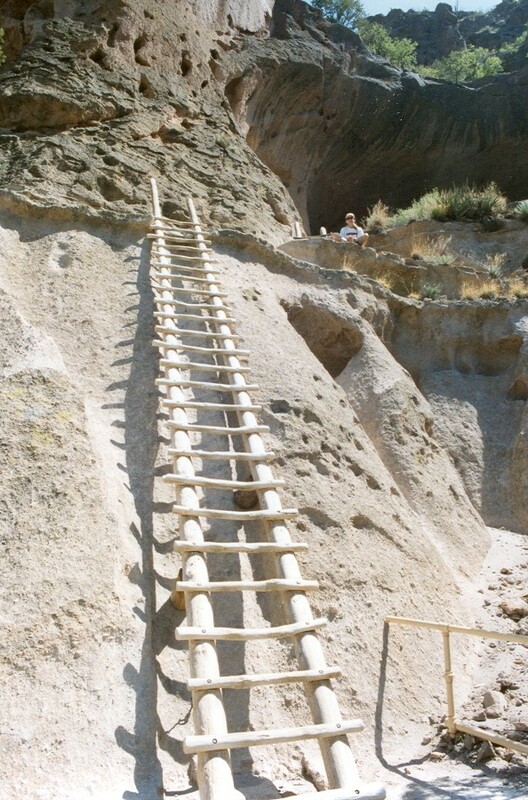 We drive to Bandelier National Park. A remarkable place containing 23,000 acres of backcountry and 60 miles of trails. Here, one finds pueblo ruins within and near tall, sheer vertical mountain walls consisting of volcanic "tuff" rock, which is low in density and easy to carve residential and storage cavities out of – which the Pueblo Indians had done significantly in this area at the height of their time here. After inspecting the ruins, we head for the Falls Trail nearby and also within the park. We walk along an attractive, pleasant river valley surprisingly graced with a cozy profusion of trees and shrubs. It is clear that the Pueblo settled here at least partly due to the access to water and pleasant surroundings. From the park, we drive to see the Valle Grande Caldera, which is a short drive away. The 14-mile wide caldera creates a valley floor formed by the collapsed volcano (formerly an enormous mountain). The caldera floor is staggering in size as it sweeps away from the highway in all directions for seemingly endless miles off into the horizon. It is the second largest caldera in the world. Despite the sunny, warm temperatures we enjoy earlier in the day, we suddenly find ourselves at the tail end of a sleet storm, which leaves enough slush on the road for some motorists to stop and have snowball fights. Our t-shirts leave us too chilly to linger at Valle Grande for very long. Next in our trip is the town of Los Alamos. Known sometimes as the "Atomic City" for the role it played in World War II, when leading scientists gathered to design and build the world’s first nuclear bomb, Los Alamos remains a place busy in scientific research. We stop at the Historical Museum in town. A small, quaint little place that is fairly interesting in its displays of those monumental days of building the first bomb. Streets in Los Alamos have colorful, appropriate names such as "Oppenheimer" Street, "Bikini Atoll" Lane, "Trinity" Road. Almost a bit too whimsical, given the grave seriousness of what has been done in this community. We then walk four blocks, which takes us to the Bradbury Science Museum. Exceptional, highly fascinating exhibits regarding science and the nuclear bomb. In what I consider to be a very good sign of an impressive museum, I find that I regret not having several days to wander through the exhibits. My favorite signature on the register for guests of the museum comes from someone from New Zealand, who states he is "glad to be from a nuclear-free country." We stay for three nights at the Casa del Toro bed and breakfast. Only a short walk from the Santa Fe plaza downtown, we thoroughly enjoy the lodging. Clean, rustic rooms. Quiet neighborhood. Modest cost. Best of all: the breakfast served each morning is perhaps the best we’ve ever been served at a B&B. Lots of fresh fruits, breads, yogurts, granola, coffee and tea, and delights such as freshly made pumpkin pancakes, breakfast burritos, and yummy fruit- and cream cheese-filled French toast. On Monday, we drive up to Taos, nestled in a valley surrounded by the Carson National Forest mountain range. Approaching the Taos valley, we are treated to the startling view of the Rio Grande Gorge, which is a large, dark crevasse snaking through the pool-table-flat valley floor of the region. No uplift at the gorge edge. Just an abrupt drop down to the gorge and river floor. 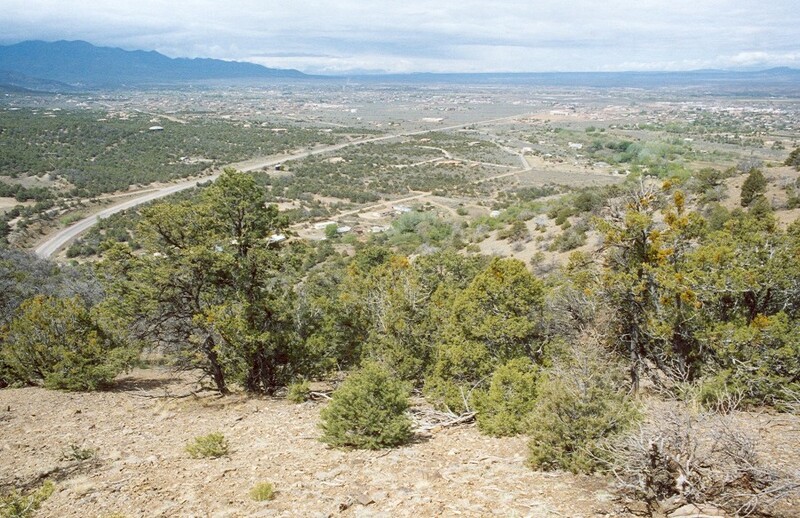 Our suggested trail hike is the Devisadero Trail in the Taos foothills within the Carson National Forest. It is an excellent suggestion. This five-mile trail takes one into the forest and regularly provides eye-opening, supremely panoramic views of the Taos valley below. Once again, the views in all directions seem to go on forever, and it quickly becomes obvious why the trail is called "Devisadero," which means "lookout." Here, the Pueblo Indians living in the area centuries ago would use this forest to look out for the possibility of approaching Apache raiding parties. The Town of Taos (about 6,000 people live here) is touted as being a quite walkable place. While I find that true, I also discover that there are only tiny slivers of walkable areas in town. A stroll of approximately an hour allows one to cover nearly all of what would be considered walkable here. Again, a rather touristy feel is found in Taos. After the hike, we sample microbeers at Eskes Brewery in the middle of town. Their Brown-Eyed Ale, Spike’s Amber, Scottish Ale and Seco Stout are all outstanding. Just south of Taos, we sample New Mexico wines at Vivac Winery near Dixon in New Mexico's northern wine region, the Embudo Valley. Who would have thunk that New Mexico wines existed? As it turns out, not only are the six wines we sample quite good (I buy a tasty "Tempranillo"), but we are also surprised to learn that wine has been made in New Mexico longer than in any other state in the US. 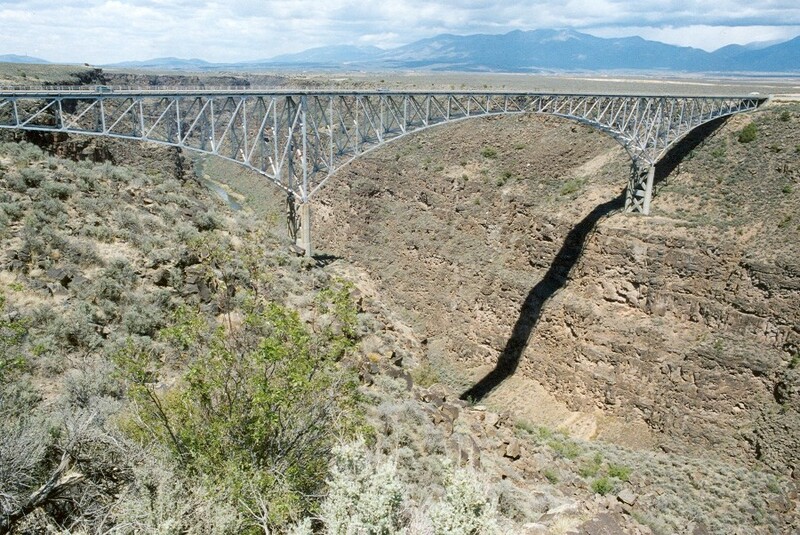 We drive out to the Rio Grande Gorge Bridge, just outside of Taos. The bridge, a continuous steel deck truss, boldly spans the gorge, and the advice is to experience walking across it on the sidewalk provided. We take that advice. At 650 feet above the river valley floor (nearly a half-mile), I find myself hyperventilating. My knees feel rubbery. The bridge vibrates disconcertingly as motor vehicles pass. I desperately hope I’m not startled by a honking, rampaging, passing tractor trailer, since I dread that I’ll accidentally launch myself over the railing and plummeting to my doom in fear of being smacked by a behemoth Mack Truck. After a quick, fleeting glance down to the bottom FAR below, I vow not to take another chance by looking down again. Even walking to the railing to look down takes courage, and I find myself hesitating before I treacherously reach out to the edge to grab the rail. But it is worth it. Looking (tentatively) over THE EDGE takes one’s breath away. Long views in both directions from the bridge along the river channel. The rushing water seems to be flowing in slow motion because it is so far down over the precipice. Like Valle Grande, we leave the bridge and drive into a hailstorm coming toward us from the eastern mountains. On Tuesday morning, we again drive south to the small village of Cerrillos, a genuinely hardscrabble "wild west"-like town that almost seems to have tumbleweeds and wooden horse-ties down its dusty streets. (Coincidentally, I happen to be reading the book "Alive" during the trip, in which the survivors of the plane crash in the Andes are said to be brought to the Argentine town of Los Cerrillos during their helicopter rescue.) The Village of Cerrillos in New Mexico would make an ideal setting for a remake of the shoot-out at OK Corral. We are here not to gun down desperadoes with our six-guns, however, but to go for a morning horseback ride at the Broken Saddle Ranch in the Cerrillos Hills. We do eight miles and two hours of cantering on our horses, which I find are the smoothest, most well-trained horses I’ve ever had the pleasure to ride, and the others agree. I end up having a great time, and once again, feel as if I am in an old west movie. One of The Magnificent Seven (except that there are only five of us), riding off into the southwestern sunset under a cruel, unforgiving, parched sun. I highly recommend signing up for a Broken Saddle Ranch ride. 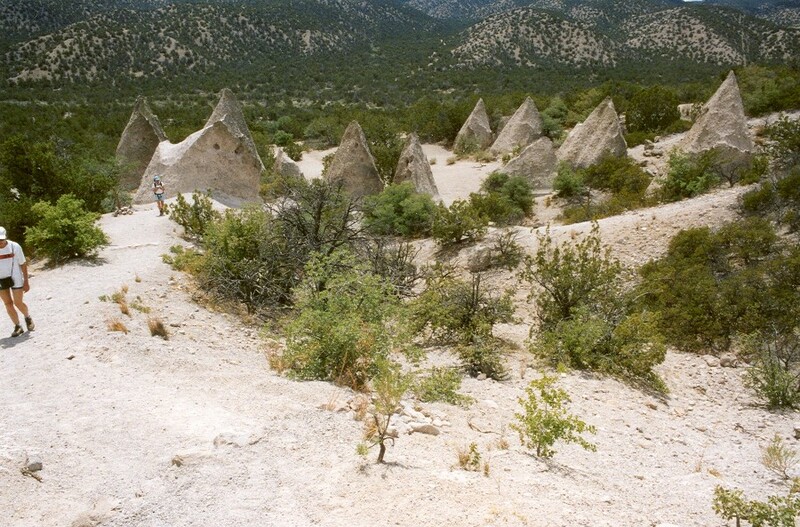 That afternoon, we arrive at Tent Rocks National Monument. If you only have time to engage in one hike while in the Santa Fe area, this is the one to take. Immediately, one comes upon a menagerie of towering, teepee tent-like rock formations that seem, well, otherworldly. Formed by ages of wind and rain, the tent rocks seem as if they are right out of a Dr. Seuss storybook. Huge, imposing, sheer mountain walls rise vertically from the floor near the tent rocks. Several very prominent, multi-colored layers in the walls from different periods of deposition characterize the mountains here. 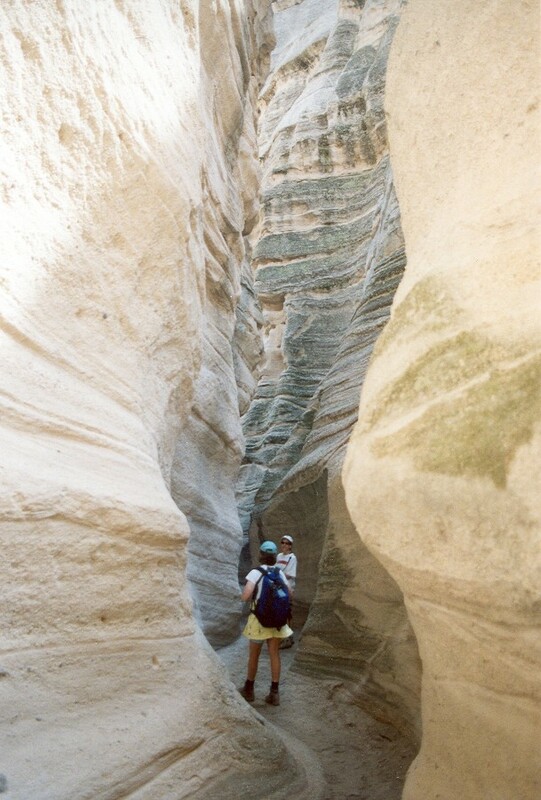 Best of all, however, is the slot canyon trail, which takes the hiker through a long, breathtaking, unforgettable slot canyon that in places is barely wide enough to allow a person to squeeze through, and with slot walls that soar over 50 feet into the air. After waiting within a slot for the obligatory afternoon shower to pass (and fearing a flash flood, which would surely sweep me to my death), I hike to the trail terminus. Before me is a vast panorama of southwestern scrub terrain, canyons, reservoirs and mountains. All of which is being advanced upon by the dark gray curtain of rain showers that has just passed the canyon. Later that night, after downing a pint of fresh, home-brewed porter beer, we have dinner at The Shed restaurant near the plaza. As is the case for every restaurant we sample during our stay in the region, the food is highly authentic, Mexican spicy, and delicious. The ambience is superbly southwestern. Even the wait staff is quite impressive. Other highly recommended restaurants we sample that share these outstanding traits include the Catamount on Water Street, the Blue Corn Café (which also serves draft microbeer in addition to the outstanding southwestern food), and the Guadeloupe Café – stupendous for breakfast in particular. Order their red chili seasoning for authentic red-hot spice. We hear not a single emergency vehicle siren during our 3 days in Santa Fe – in stark contrast to my city of Gainesville, where fire trucks, helicopters and ambulances rage 24/7. It is a sleepy, peaceful, relaxing, highly admirable ambience. Compared to the loud, nerve-fraying experience in Gainesville, the silence is nearly deafening. I’m certain, by the way, that no babies died in burning buildings, as they say, while we were there. As a child being taken to the southwest, I still recall seeing the Native Americans selling their turquoise jewelry along the sidewalk, and such retailing is still quite evident in Santa Fe today, as Native Americans ring the Santa Fe plaza sidewalks with this stereotypical fare. Taos and Santa Fe almost, but not quite, have the character of a walkable European city. The plazas and the compact nature suggest an Italian town. 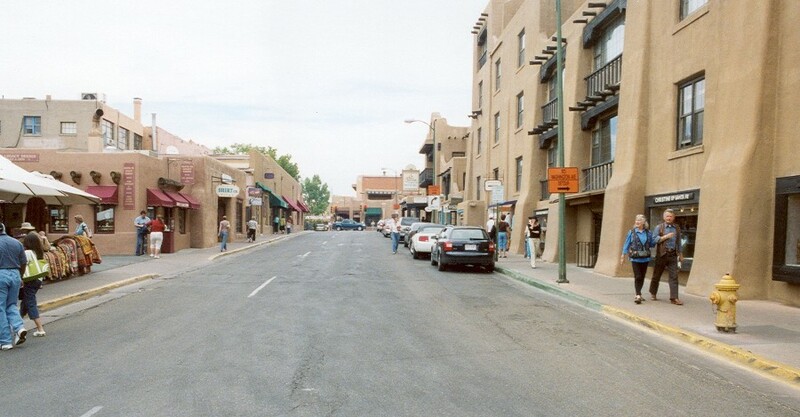 Santa Fe, in particular, is to be congratulated for its efforts to retain its southwestern character by insisting that the architecture of new buildings use an adobe style. But in my opinion, architectural style is not the imperative for retaining a walkable, unique, quality-of-life character. Crucially, what Santa Fe and Taos fail to do, despite their aggressive land development regulations -- what prevents them from achieving the glory of a European village – is the failure to require buildings in the downtown area to be pulled up to the street, and for the surface parking to be tucked away modestly. Instead, a great many recent developments in both towns are set behind enormous surface parking lots (not to mention over-sized, over-dimensioned roads and intersections). Often, a large surface lot is at the corner of an intersection, which kills place-making and destroys a walkable ambience. Yes, the adobe architecture is lovely. But when the adobe Hilton is set behind seas of asphalt, the unwalkable, place-less, Anywhere USA crudscape that Jim Kunstler decries, trumps all efforts to build character through building architecture. Overall, however, despite these flaws, we find Santa Fe and Taos to be quite pleasant places to visit.